Paxton House 21st April to 31st October 2013. In Country House like Paxton there is usually ample evidence of the lives of the owners and their families. The lives of their servants are less well documented. However in the writings, wages books and household account ledgers of the Home family there are valuable fragments of information. When these are put together, the working lives and characters those who served the Home family in their various houses, begin to emerge from the shadows. As well as hard facts such as rates of pay, terms of employment, cost of uniforms and servants perks, there are more personal glimpses of the people themselves; the butler who struggled with alcoholism was given a second chance after stealing his masters whisky but finally “let go” after drinking the “spirits of wine” or “ meths” for the lamps; the coachman who fared better, avoiding the sack by joining the Temperance Society and was still in the Home’s employment 10 years later. Some of the most exciting finds were photographs although usually the servants are on the sidelines of a photograph in the family album. There are grooms holding horses, a coachman seated on the carriage and nursemaids and governesses with the children. The Paxton gamekeeper is pictured with his dog, and the rather homely dairymaid with a bucket and her ginger cat. In some cases the names are known but sadly, most are anonymous. An exhibition well worth a visit. 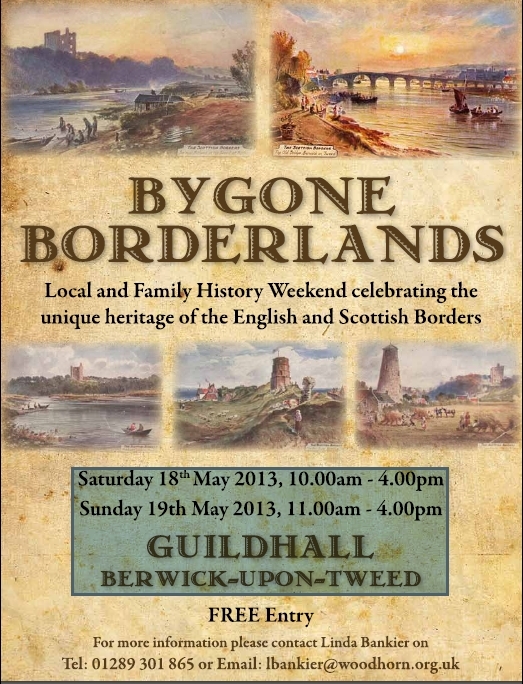 11 May 2013 in Galashiels, Scotland; Berwick Record Office are holding their annual event, Bygone Borderlands, on 18 and 19 May 2013 in the Guildhall, Berwick on Tweed, England. This is a very popular event with displays about the history of North Northumberland and the Scottish Borders, talks and exhibitors. Entry is free and tasty refreshments will be available. Opening hours are Saturday, 10am to 4pm and Sunday. 11am to 4pm. More information from Linda Bankier on 01289 301865. Remember, this is the weekend after our conference. Online booking for our conference has closed. Ancestry is offering free access to its marriage records until midnight on Sunday. As usual, you'll need to register or log in. Book now for our Conference on 11th May 2013 in Galashiels, Scotland. With our Migration-themed conference and family history and local history fair in Galashiels, Scotland on 11th May, just over a month away, we're finding more ways to find information on migrants. Marjorie Gavin found free online access to the Brooklyn Daily Eagle from 1841 to 1955 useful. The parent website, Fulton History, has almost 22 million pages from newspapers published in New York state, USA between 1795 and 2007, and I've found over 50 articles about my (until now, mysterious) great-uncle Arthur who emigrated to New York in the 1890s. Laurie Williams from Colorado, USA, wrote to me about a pair of 137 year old boots her father bought from an antique dealer in Michigan 35 years ago. These small hand crafted boots were owned by a little girl named Charlotte Wintrup who died at 4 years old in Walkerburn. The antique dealer was cleaning the boots one day and discovered a small note in the toe of one of the boots. It was written by the little girl's father, James Wintrup. 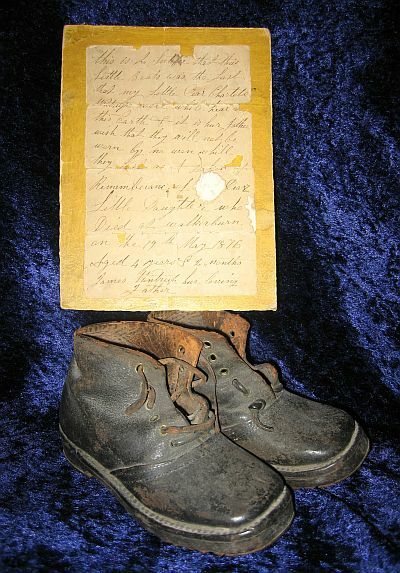 "This is to certifie that these little boots was the last that my little Dear Charlotte Wintrup wore while hear on this Earth & it is hur Fathers wish they will not be worn by no won while they are as a token of Rememberance of my Dear Little Daughter who died at Walkerburn on the 19th May 1876 Aged 4 years & 2 months, James Wintrup hur loving Father". The boots moved from place to place across the USA as her family moved. Back in 1978, her father accepted a job in the Middle East and although many of the antiques her father and mother had collected, as well as all their household furniture, were lost in a warehouse fire, Charlotte's boots had been stored with her grandmother and they were spared from the fire ! Charlotte was born in Galashiels. Her father was James Wintrup, son of John Wintrup and Margaret Gray. He was born about 1829 in Kelso and died 20th March 1896 in Galashiels. Charlotte's mother was Charlotte Brown, born in 1832 in Darnick and she passed away in Galashiels on 25th November 1882. According to the census, the family were millworkers in Galashiels. Are you related to those Wintrups ? If you are, please get in touch, either at Old Gala House or via our Contacts page selecting the Contact Type 'Border Telegraph'.